In a small shallow bowl, mix the first nine ingredients. In a separate small shallow bowl, whisk together the egg, milk, garlic powder, lemon juice and honey until well blended. Dip the chicken in the flour mixture to coat all sides; shake off excess. Next dip in the egg mixture, then again in the flour mixture. Set chicken aside on a plate to rest for 10 minutes. Pour the peanut oil into the cast iron skillet over medium high heat (it should be about one inch deep in the skillet, coming about halfway up the food). Heat the peanut oil to 375°F. 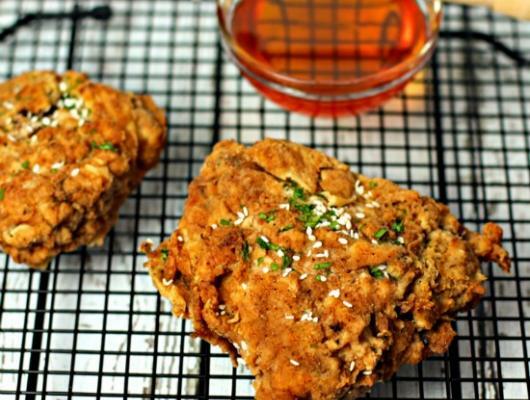 Fry the chicken, a few pieces at a time (do not crowd), 3-5 minutes on each side or until golden brown. Transfer the chicken using tongs onto the baking sheet. Bake in the oven until the chicken is done (165°F). Drizzle a little honey over the top, if desired. 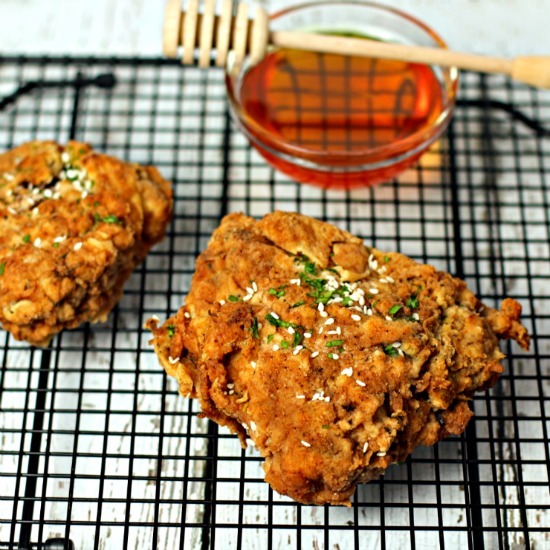 This tasty, juicy Honey Fried Chicken gets ridiculously golden crispy from the honey buttermilk batter and lip-smacking seasoned breading!